French fries (American English), chips (British English), fries, finger chips (Indian English), or French-fried potatoes are batonnet or allumette cut deep-fried potatoes. In the United States and most of Canada, the term fries refers to all dishes of fried elongated pieces of potatoes, while in the United Kingdom, Australia, South Africa, Ireland and New Zealand, thinly cut fried potatoes are sometimes called shoestring fries to distinguish them from the thicker-cut chips. French fries are served hot, either soft or crispy, and are generally eaten as part of lunch or dinner or by themselves as a snack, and they commonly appear on the menus of fast food restaurants. Fries in America are generally salted and are often served with ketchup; in many countries they are topped instead with other condiments or toppings, including vinegar, mayonnaise, or other local specialties. Fries can be topped more heavily, as in the dishes of poutine and chili cheese fries. French fries can be made from sweet potatoes instead of potatoes. A baked variant of the french fry uses less or even no oil. Some claim that fries originated in Belgium, and that the ongoing dispute between the French and Belgians about where they were invented is highly contentious, with both countries claiming ownership. From the Belgian standpoint the popularity of the term “French fries” is explained as a “French gastronomic hegemony” into which the cuisine of Belgium was assimilated because of a lack of understanding coupled with a shared language and geographic proximity between the two countries. Belgian journalist Jo Gérard claims that a 1781 family manuscript recounts that potatoes were deep-fried prior to 1680 in the Meuse valley, in what was then the Spanish Netherlands (present-day Belgium): “The inhabitants of Namur, Andenne, and Dinant had the custom of fishing in the Meuse for small fish and frying, especially among the poor, but when the river was frozen and fishing became hazardous, they cut potatoes in the form of small fish and put them in a fryer like those here.” Gérard has not produced the manuscript that supports this claim, which, even if true, is unrelated to the later history of the French fry, as the potato did not arrive in the region until around 1735. Also, given 18th century economic conditions: “It is absolutely unthinkable that a peasant could have dedicated large quantities of fat for cooking potatoes. At most they were sautéed in a pan…”. Some people believe that the term “French” was introduced when British and American soldiers arrived in Belgium during World War I and consequently tasted Belgian fries. They supposedly called them “French”, as it was the local language and the official language of the Belgian Army at that time, believing themselves to be in France. At that time, the term “French fries” was growing in popularity. But in fact the term was already used in America as early as 1899, in an item in Good Housekeeping which specifically references “Kitchen Economy in France”: “The perfection of French fries is due chiefly to the fact that plenty of fat is used”. “Pommes frites” or just “frites” (French), or “frieten” (Dutch) became the national snack and a substantial part of several national dishes, such as Moules-frites or Steak-frites. In France and other French-speaking countries, fried potatoes are formally pommes de terre frites, but more commonly pommes frites, patates frites, or simply frites. The words aiguillettes or allumettes are used when the French fries are very small and thin. One enduring origin story holds that French fries were invented by street vendors on the Pont Neuf bridge in Paris in 1789, just before the outbreak of the French Revolution. However, a reference exists in France from 1775 to “a few pieces of fried potato” and to “fried potatoes”. Eating potatoes for sustenance was promoted in France by Antoine-Augustin Parmentier, but he did not mention fried potatoes in particular. Many Americans attribute the dish to France and offer as evidence a notation by U.S. President Thomas Jefferson: “Pommes de terre frites à cru, en petites tranches” (“Potatoes deep-fried while raw, in small slices”) in a manuscript in Thomas Jefferson’s hand (circa 1801–1809) and the recipe almost certainly comes from his French chef, Honoré Julien. In addition, from 1813 on, recipes for what can be described as “French fries” occur in popular American cookbooks. By the late 1850s, a cookbook was published that used the term French fried potatoes. Frites are the main ingredient in the Canadian/Québécois dish known (in both Canadian English and French) as poutine; a dish consisting of fried potatoes covered with cheese curds and gravy. Poutine has a growing number of variations but is generally considered to have been developed in rural Québec sometime in the 1950s, although precisely where in the province it first appeared is a matter of contention. In Spain, fried potatoes are called patatas fritas or papas fritas. Another common form, involving larger irregular cuts, is patatas bravas. The potatoes are cut into big chunks, partially boiled and then fried. They are usually seasoned with a spicy tomato sauce, and the dish is one of the most preferred tapas by Spaniards. Some speculate that fries may have been invented in Spain, the first European country in which the potato appeared from the New World colonies, and assume fries’ first appearance to have been as an accompaniment to fish dishes in Galicia, from which it spread to the rest of the country and then further away, to the “Spanish Netherlands”, which became Belgium more than a century later. Professor Paul Ilegems, curator of the Frietmuseum in Bruges, Belgium, believes that Saint Teresa of Ávila of Spain cooked the first French fries, and refers also to the tradition of frying in Mediterranean cuisine as evidence. 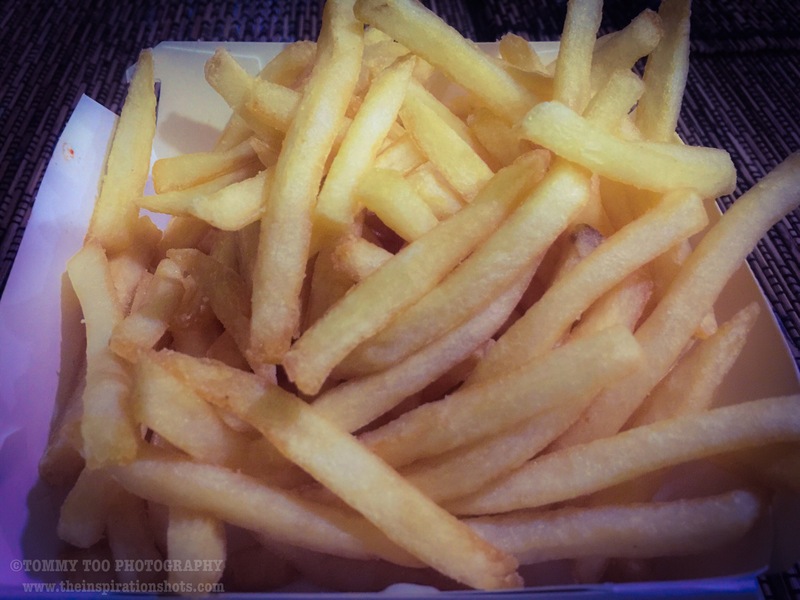 Posted on December 4, 2016, in iPhoneOgraphy 366, Photography and tagged #iphone6plus, #iphoneography366, #photography, food, frenchfries, fries, snack. Bookmark the permalink. 2 Comments.